A fitting memorial to Roy Baker, of Magnolia Arkansas, the father of the Pancake holster design. Roy’s Hidden Thunder concept allowed detectives, off duty police officers and concealed weapons toting citizens to easily wear and conceal large autoloaders and big revolvers. 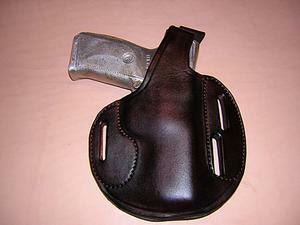 The Tribute is very similar to Roy Baker’s pancake holsters, but we make them from thicker, high quality leather. These holsters protect the gun very well. If your Department requires a thumb break this is the way to go. Otherwise, we recommend the Sourdough, Cuda, or Defcon 3 Pancake Holsters. No snaps or straps in the way and excellent retention. This is the most popular model for GIs. 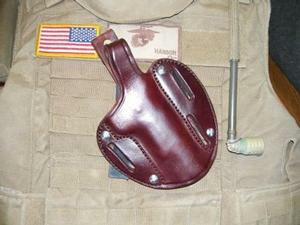 We can make this holster with MOLLE straps, so you can wear this on your plate carrier, on your belt or chest. These Tribute pancakes are built for 1911's to be carried with the hammer back & safety on. (Cocked & Locked). This holster is not designed for single action firearms or hammerless guns. Note: The Tribute is for a limited number of autoloaders and for shorter revolvers only (barrel length can be no longer than 4"). Check out our Sourdough Pancake™ for longer barrels. 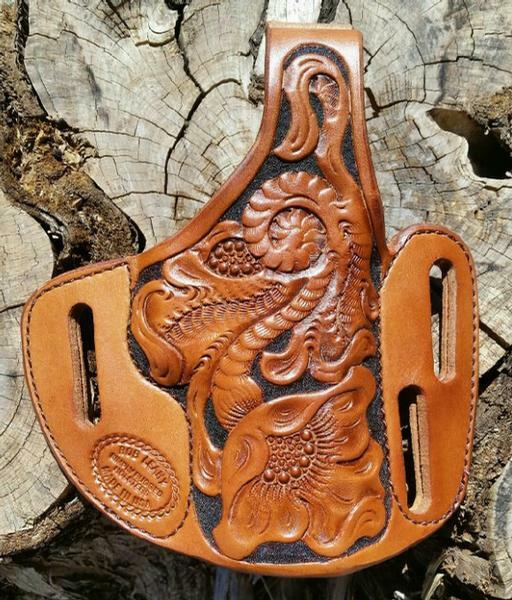 Do not order this holster for a hammerless gun. Note: Black leather with carving are not a good combo. Oxblood or tan are a better choice.